Willow clutched the little clay bee-shaped hair tie tightly in her hand and felt its coolness against the skin of her palm. Notch had given her the little bauble just a while ago, and she'd been touched by the significance of the gift. After all, her charming bees was what had forged their friendship so long ago. But that didn't change the fact that this whole past day was confusing, to say the least. By all rights, she should be angry at her friends who had set her up to force her to make up with Notch the past morning. Notch had planned the whole scheme to get her alone in that old den during free-time from his punishment � the time he was usually asleep, and he'd enlisted an ensemble to help execute his plan. Rainpace had tricked her into the den, Evervale had sealed the den closed, and Willow thought she had heard Pathmark's snicker, too. There might have been others involved, too. Willow didn't know for sure. She'd bide her time and figure out both who helped and a way to prank them all in return. But right now, revenge wasn't a priority. It was nice to be on speaking terms with Notch again. When he'd given her the hair tie he'd made it had felt good. She pondered his invitation to come share his den next dawn, which she had neither accepted nor declined. She needed to think about it some more. Because... even though the day had turned out all right, Willow wasn't quite happy, and she couldn't quite put a finger on why. Things were going back to normal � at least to the normal Willow used to know. But why did it still feel like her making up with Notch wasn't quite right? Was it because of the circumstances under which the amends happened? Again, Willow felt she had the right to be angry about it. But, no, it wasn't that. She was dead tired, too -- a result of not getting much sleep during the day -- but her mind was too busy to let her sleep. She'd gone for a jump in the river instead, to cool off and mull things over, but being cold and dripping wet didn't seem to make her feel any better, either. When she had finished drip-drying and as she re-dressed herself, her mind kept going back to a single thought � that even though she had fun making up with Notch last night � a lot of fun � she still would have rather been with Beetle. It started to worry her that she felt that way. Beetle was a good friend, just like Notch and Rainpace were, right? So why was she suddenly feeling so attached? Admittedly, she had been spending a lot of time with Beetle lately. She'd developed a habit of waiting in Beetle's den when the sun was coming up so she'd be there when Beetle got back from her work-punishment for the day. And when Beetle did come home, Willow would spend time rubbing Beetle's back or using her powers to soothe whatever sore muscles Beetle had earned that day from her time of hard labor. Beetle usually fell asleep quickly after Willow started, but that was all right. Willow enjoyed lying next to Beetle and listening to her breathing until she fell asleep, too. When evening came, Beetle would need to be up early for whatever work they had for her next. Willow would see Beetle off with a silent promise to herself that she'd be back when the sun was up to meet her again. It bothered Willow that she hadn't been there this morning. It wasn't her fault; she knew that. But had she really become so attached? She didn't even need to ask that to know she had. But what did that mean? Was it time to reconsider what she had been doing? It worried her even more when something pricked the back of her mind, telling her she would deeply miss her daily visits with Beetle if they were to stop. If Beetle knew about these feelings of attachment, what would she think? Beetle had an experience in the past with Pathmark when their relationship grew serious and it shouldn't have. And Willow had always vowed she'd never be serious with anyone. Period. Getting serious just complicated things. That was a strict philosophy Notch had ground into her head since she was young, and it was a wise one. Being serious had risks. It made you responsible for someone else. It could tie you down. Willow was struggling hard enough with the fear her healing powers would get in the way of keeping her freedom, as it was. Willow slapped at the water at the river's edge and growled. Why was her head in such a weird place this evening? She didn't like it. Was it due to lack of sleep? She vowed then and there she'd keep her feelings to herself. Getting serious with anyone would complicate things. It would tie her down. She didn't need her life to be even more difficult than it already was at the moment. So maybe, she decided as a painful afterthought, it was probably good to give Beetle a few more nights to herself. Willow had to get herself past this and move on. She tried her best to push the jumble of confusing thoughts out of her head and decided to go see if Greenweave was busy. She pulled the old, frayed hair tie out of the bottom of her braid and went to search him out. Might as well have him re-braid it while it was still wet. Besides, the braid was coming unbound and needed to be re-done, and she did have this new hair tie. Plus, things were always so laid-back with Greenweave. Maybe a calm presence was what she needed to get out of this weird headspace and let her thoughts get back to normal. Greenweave smiled at her. �Nonsense! I've got time for that. Sit down.� He retrieved a bone comb from his belt-pouch and looked at Willow expectantly. How could Willow say no? She couldn't think of a good excuse to refuse now, so she sat and made herself comfortable. She wondered if Beetle would arrive before Greenweave had finished with her hair. Maybe coming here had been a mistake. �No,� she chuckled, �just the same braid.� He asked her this question every time she went to see him. �I have a new one for you to use,� Willow interrupted, and held up her hand with the new honeybee-shaped tie in it. Greenweave took it. �But?� Greenweave paused in his work removing the braid, waiting for Willow to continue. �All right.� Willow folded her arms in her lap. She shook her head from side to side. It felt so different not having the weight of the long braid there. 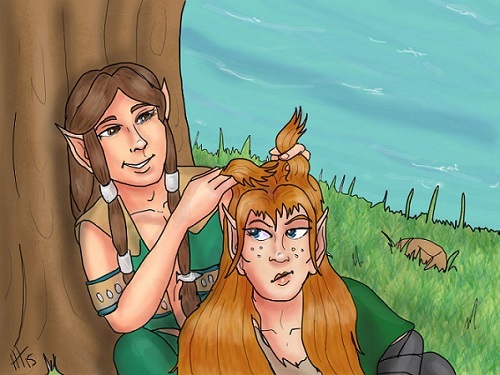 Greenweave hrrmphed at that pitiful excuse and started combing Willow's hair, gently trying to remove what snarls he had found. Some of them, unfortunately, were quite stubborn. �I know, I know,� Willow said good-naturedly, although she knew she probably hadn't learned her lesson. Greenweave finally coaxed out that snarl, and went on to the next. �So, what other plans did you have for the morning if you hadn't been paired up with Notch?� Greenweave asked as he slowly worked at the next knot. �Nothing,� Willow said, even though she knew it wasn't the truth. �No. Yes.� High Ones, what was she saying!? �I don't know!� Willow blurted then, feeling her frustration rise again. �Maybe there is,� she said defensively. �Nothing's wrong with any of that. I think you should tell her,� Greenweave said, after barely a moment's pause. Willow was silent. She didn't know how to respond to that. Willow shook her head, but she still wasn't convinced she should say anything at all. There were footsteps behind them then, and Willow knew it was Beetle before she even arrived. Had she heard any of the conversation? Badger's blood, Willow hoped not! Her heart leaped up into her throat. Beetle stopped in front of them. �I'm ready to work, Greenweave,� Beetle said, and then turned to Willow. �Hi, Willow,� she said with the hint of a smile. �Hey,� Willow said, and couldn't help but return the smile. It really was good to see Beetle, and good that she didn't seem angry about leaving her alone, at least. But wait � was Beetle sunburned? Willow suddenly felt even worse for not being able to meet Beetle last night. Beetle looked surprised as she took the two items, and Willow gaped as Greenweave turned and walked away. **Tell her,** Greenweave sent to Willow, and then he said no more.